FATC is showcasing a new, thought provoking dance collaboration as a way of bringing awareness of gay rights in Africa to theatre audiences in Johannesburg, for three performances only, from 30 October to 1 November. “Would I choose to be gay if know I’ll be minority, and be pounded for it?”- David Kato, Ugandan gay rights activist. The FATC (Forgotten Angle Theatre Collaborative) is collaborating with the talents of Zimbabwean choreographer Mcintosh Jerahuni, UK-Zimbabwean-Malawian director Melissa Eveleigh and the FATC dance cast, namely Thulani Chauke, Nosiphiwo Samente, Nicholas Aphane, Thabo Kobeli and Charlston Van Rooyen, to bring a striking new piece of social commentary through dance, to the stage. And, it will question everything we know about minority rights and more specifically gay rights in Africa. The collaborative piece titled H28 – Love in a time of hammers, forms part of the UJAC’s That so Gay Fest 2014 and is dedicated to Ugandan gay rights activist David Kato, who was a spirited activist, with a vibrant and courageous approach to his work and life. His ultimate dream was to turn his mother’s cassava farm into a gay village, whilst his society wished him dead. Tragically, this wish became a sad reality in 2011 when the ‘Kill the Gays’ bill was being tabled – Kato had sued the local Ugandan newspaper, Rolling Stone, for publishing photographs of people it labelled as gay with the headline “Hang them”. Just after his success in court he was gruesomely bludgeoned to death with a hammer and, while the police found no connection, many still believe his death was the result of vigilante gay-bashing. Fast forward to February 2014 and Uganda has passed a new anti-homosexuality bill toughening the penalties for gay people. The proposed bill included the death penalty for ‘repeat offenders’ and ‘aggravated’ homosexual acts, as well as imprisonment for those found guilty of not reporting gay people to the police. This has started a frenzied media campaign to ‘out’ and shame gay people, and carries with it fearful and ignorant rumours about homosexuals in the country. Inspired by Kato and the situation in Uganda and using it as a starting point, the FATC created H28 to challenge homophobic perceptions. The piece explores the personal and political conditions in which lesbian, bisexual, gay and transgender people live in Africa. It depicts an assortment of mad contradictions and poignant possibilities at a crucial frontier of human rights on the continent. Funded by RMB, Pro Helvetia SDC Ant Funding and BASA, H28 is yet another powerful and shocking FATC- inspired socially-conscious dance narrative, which will bring to stage a provocative awareness of injustice in the world. Since inception in 1995, FATC and its collaborative artists have been repeatedly recognised for their excellence in the field of contemporary South African choreography and performance through numerous awards and nominations. 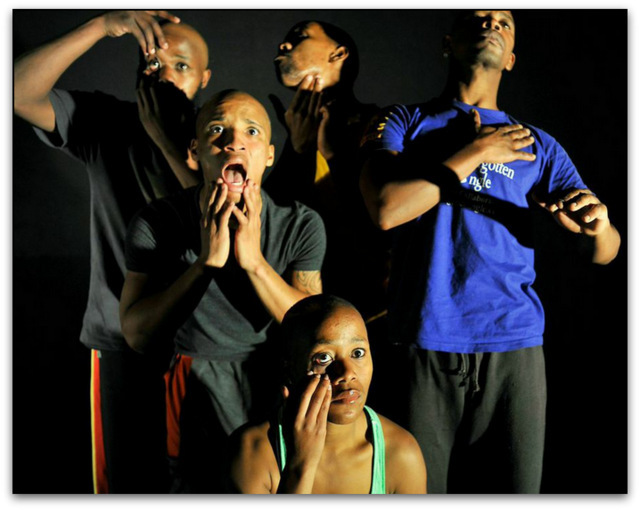 The prolific company is best known for its thought-provoking dance pieces depicting personal and social issues, and has often been referred to as a leading voice in the emergence of the new South African “protest/struggle” theatre. FATC has also been instrumental in collaborating with an extensive number of South Africa’s leading contemporary dance professionals and partnered with some impressive dance and theatre companies. The company has presented works abroad bringing audiences to their feet in countries as far afield as Russia, Holland and Mexico, to name some. FATC founding member and artistic director PJ Sabbagha is a South African talent whose name has become synonymous with issue-based dance theatre and more specifically HIV and AIDS-focused art. He was the recipient of the 2005 Standard Bank Young Artist Award for Dance and the 2006 FNB Dance Umbrella (Gauteng MEC for Arts and Culture) Award for Best Choreography for his work Still Here. He has received numerous other awards and nominations for his works, including being voted top South African Artist in 1995 as well as being in the top 10 of the Star Tonight’s annual top 100 South Africans. To add to his endless list of achievements, PJ travelled across the USA as a guest of the US State Department to participate on the 2007 International Visitors Leadership Program investigating HIV-AIDS and other infectious diseases. His dance works have been shown at festivals and theatres all over the world while he has participated in residencies in Russia, Mexico, Holland, Tanzania, Mali, Mozambique and Taiwan. Over the past 4 years FATC has initiated numerous Residency opportunities that have created a platform for emerging and experienced choreographers to create work with the company. These include Athena Mazarakis (SA), Gaby Saranouffi (Madagascar), Shanell Winlock (SA), Eric Languet (Reunion Island), Nadine Joseph (SA), Themba Mbuli (SA), Ivan Estegneev and Evguene Kuligan (Russia), Fana Tshabalala (SA) and Mcintosch Jerahuni (Zimbabwe) and Melissa Eveleigh (UK). Zimbabwean born choreographer Mcintosch Jerahuni is also a talented musician and dancer. He received his training and experience at Savannah Arts, where he practised traditional dance; Zvishamiso Arts, where he learnt the art of dance while working with choreographer Brian Geza; and the Dance Foundation, where he learnt multiple dance and performance disciplines. While training at the Dance Foundation, he developed a keen eye for choreography and created his first piece, a solo called Runyararo, which premiered at the Harare lnternational Festival of the Arts (HIFA) in 2009. He is currently working with Tumbuka Dance Company, where he has choreographed two works. He has also established Jerahuni Movement Factory, a community arts project. As a musician, Jerahuni plays the mbira instrument while leading his Jerahuni band. Award-winning UK Director/writer and accomplished development practitioner Melissa Eveleigh has lived and worked in Southern Africa since 2002. Melissa co-founded and ran the national arts and development NGO, Nanzikambe Arts, in Malawi from 2004-2010. More recently she established the Arts Lab, a cultural development programme for performers in Zimbabwe. She wrote and produced an award-winning dance-theatre production titled Can’t Talk About This, which played at the Grahamstown National Arts Festival in 2013. Eveleigh trained in physical theatre at LISPA (The London International School of Performing Arts) and has extensively used the arts as communication for education, therapy, sexual and reproductive rights, health, human rights, and most recently, for legal rights with the GIZ Rule of Law programme in Bangladesh. H28 – Love in a time of hammers will be staged in Johannesburg at the Con Cowan Theatre. There will be three performances only – 30 October at 7.30pm, 31 October at 7.30pm and 1 November at 3pm. Tickets cost R50 and can be booked via pj@forgottenangle.co.za or purchased at the door. Please note there is an age restriction of 16 years and under. For more details visit www.forgottenangle.co.za or find the FATC on facebook.